Our January 26, 2014, Party for Climate Action! 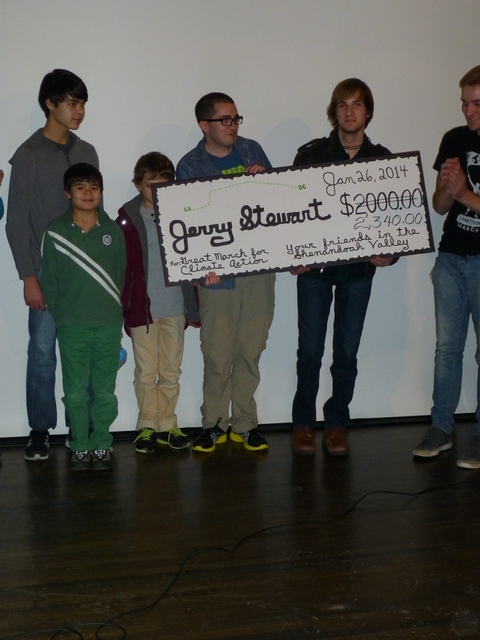 raised $2340.00 to send Virginian Jerry Stewart on The Great March for Climate Action! He will join several dozen other people walking from Los Angeles, CA, to Washington, D.C. from March 1 to November 1, 2014, to draw attention to the urgent need for work to resolve the climate crisis. Many thanks to all the people that made this event possible, inspirational and successful! Click on the image below to find more photos of our party in a Picasa web album. Photos by Carl Droms. And more photos here in a facebook album thanks to Valerie Serrels! 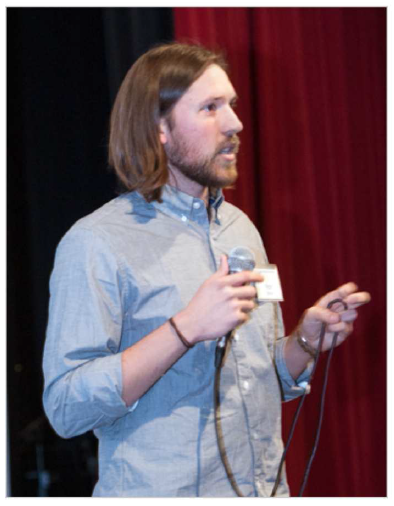 See Jonathon Shacat’s coverage of the event for the January 27, 2014, issue of the Daily News Record: Event Raises Money for Climate Walk. Join us for a Sunday happy hour (or two) with live music, food, drinks, and a few films to send off fellow Virginian, Jerry Stewart, on The Great March for Climate Action. Come hang out and find out more about Jerry, the March, and why anyone would want to walk across the United States. Is he crazy? Or does Jerry join the ranks of those who have walked and marched throughout history for social action. You decide! 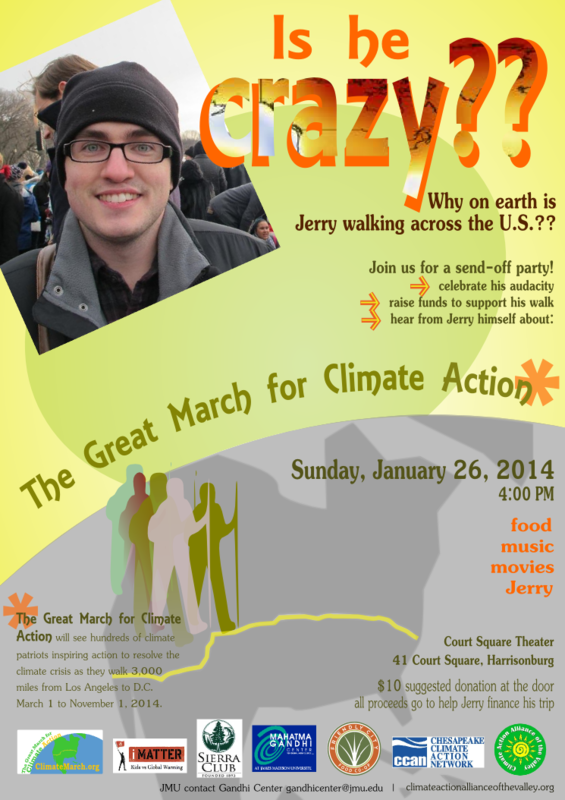 Please join us in celebrating The Great March for Climate Action and our own local climate hero, Jerry Stewart! On March 1, hundreds of climate patriots will set out from Los Angeles on a 3000 mile cross country journey to change the hearts and minds of the American people, our elected leaders and people across the world to act now to address the climate crisis. Jerry Stewart, of Loudoun County, VA, will be in this number! Cathy and Charlie Strickler of CAAV, and the Serrels family of iMatter Youth, met Jerry as they were all participating in the Walk for our Grandchildren back in July. They can vouch for the fact that he’s not crazy, just convinced that the fight against climate change is a scientific and ethical challenge he can take to the people he meets along the route taking him to Washington, D.C. by November 1, 2014. We want you to meet Jerry, find out why he’s taken on this daunting adventure, ask questions about the Great March for Climate Action, and realize the critical role long marches have played in world history. In fact, if you’re so inclined, you’ll have the chance to sign up to march yourself, either all or part of the way! Sea of Change, a Chesapeake Climate Action Network film, brings home the consequences of climate change on Virginia. The film’s director, Spotswood High School and JMU School of Media Arts and Design alumnus Peter Jackson, will be attending and introduce his film to us! CCAN’s Emily Heffing will offer comments following the film. Walk for Our Grandchildren chronicles the journey of dozens of grandparents, parents and young people traveling 100 miles on foot from Camp David to the White House from July 19th to July 27th, 2013. Introduced by Gary Race of the JMU Gandhi Center, with comments from iMatter Youth walkers Grant and Garrett Serrels. Each Marcher must raise $5000, or $20/day, to cover the costs of food and logistical support for their 245 days on the road. Our event is serving as a fundraiser for Jerry. We are asking each person who attends for a $10.00 or more donation that will go directly in Jerry’s name to the Clarion Alliance Fund, which is the fiscal sponsor for the Great March for Climate Action. The Fund is a Des Moines based officially recognized 501(c)(3) non-profit organization working since the 1980’s on a variety of peace and justice concerns. Here’s hoping to see you from 4:00 – 6:30 pm, Sunday afternoon, January 26, at Court Square Theater, 41 Court Square, Harrisonburg! Sponsored by: Climate Action Alliance of the Valley, iMatter Kids vs. Global Warming, JMU Mahatma Gandhi Center for Global Nonviolence, Shenandoah Group of the Sierra Club. With special thanks to The Picnic Basket for their generous food donations!